In the dimensional metrology of surface nanostructures, two critical challenges have been recently emerged; The first is to determine the metrics (parameters and functions) which quantify the uniformity of feature sizes and the sidewall roughness of each feature (line or hole edge roughness). The second challenge is to characterize the positional randomness of nano-features quantifying the degree of randomness by appropriately defined metrics. Up to date, the relevant metrological interest in optical and EUV lithography has been focused on the first challenge (CDU/LER/LWR studies) since the use of photomasks provides fully ordered spatial arrangement of nano-features with no positional randomness. However, DSA lithography brought to the attention of litho-metrology community the second challenge for the characterization of placement errors of nano-features (lines and holes) due to the self-assembled nature of their fabrication. Furthermore, it is significant to study the impact of pre-pattern roughness on DSA Lithography line roughness and placement. In the first part of the paper, we apply properly adapted the well-established three parameter model for the characterization of LER/CDU and we calculate the HHCF and PSD of oscillating lines (see Fig. 1a and b). Based on the above results, we highlight the differences of LER/LWR in DSA structures with conventional LER and elaborate a model for their description. Secondly, we deal with the characterization of line placement error and roughness in DSA lines and suggest analytical relationships revealing correlations among different metrics. Finally, programmed roughness of pre-pattern is used to analyse the transfer to the post-pattern line/edge roughness and placement accuracy. The ultimate aim of our work is to propose a protocol for the dimensional, positional and roughness metrology of DSA nanostructures based on statistical tests and well-established theoretical results. 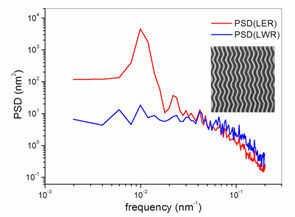 (a) Power Spectral Density of LER (red line) and LWR (blue line) of DSA oscillating lines shown in the inset top down SEM image. Notice the peak at f=0.01nm-1 indicating the oscillation period of lines at 100nm as well as the increased contribution of high frequency fluctuations in LWR revealed by the intersection of two curves at high frequencies. 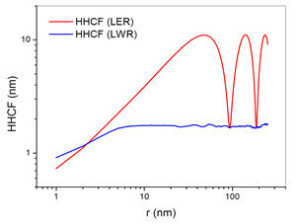 (b) Height-Height Correlation Function (HHCF) of LER (red line) and LWR (blue line) of DSA oscillating lines shown in the inset top down SEM image of Fig.1. Notice the dip at r=100nm indicating the oscillation period of lines at 100nm as well the increased contribution of high frequency fluctuations in LWR revealed by the intersection of two curves at small r.